Alexis Davenport is learning to come to grips with her ability to travel through time, but she still hasn’t been able to stop the evil Drifter and his Master from trying to alter the past. When she travels back to ancient Egypt, Alex gets a most unexpected surprise; she meets someone who can help her figure out how to use her powers, another Traveler like herself. But can Alex learn how to control her gift before Drifter finds a way to stop her from meddling in his Master’s plans? 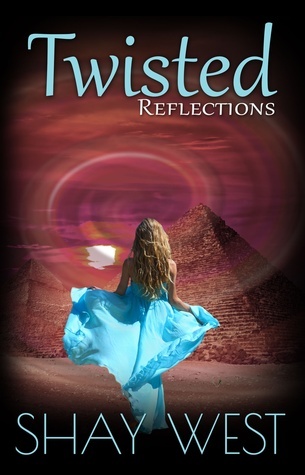 Twisted Reflections is the second book in the Adventures of Alexis Davenport series and one that offers up a bit more information in the mystery that is Alexis Davenport and why she may have been chosen to stop someone messing with history. Alexis meets another traveller like herself during one of her trips who tries to help guide her on what her role may be. Their chance meeting gives Alexis an opportunity to gain more insight into her gift and realise just how important her mission is. The novel covers a longer amount of time, but does jump forward most of it, skipping a lot of the school year. There is less importance placed on the Catelyn/Beau drama of the first book, and while there seemed to be a tense build up to the new school year West chooses to skip most of it instead, choosing to focus more on the summer holidays and Alexis’ relationship with her mother and friends. Once again I felt that the time travelling aspect was a better read than the other parts in terms of story, style, and character, and though while some of the parts that faulted last time are improved, other issues develop and some are just redirected. Alexis again comes across as petulant and whiny, and she is certainly petty and jealous, but I’m starting to see that’s just who she is. But considering how much better she is when she is travelling it’s hard to see her as the same personality, though admittedly sometimes it slips through. The writing and narrative is not perfect but the story is interesting and keeps you reading. The characters have out of the blue emotional outbursts and occasionally seem unreasonable and peculiar with no real explanation or warning but this does not really take away from enjoying the other parts of the story. The real intrigue comes from the time travelling parts where West writes curious and fascinating versions of historical moments and points in time. You forget any issue you had with the other parts and become involved with the period of time and the story it involves. The concept West has created is engaging and intriguing, with enough mystery and variability to keep you guessing and eager to find out, but not slow enough that it becomes predictable. The ending is also once again very well done. It manages to bring the story to a new level and natural progression that adds a twist and a surprise to the reader while also offering more information and making you eager for the next book.